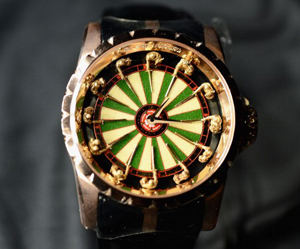 2013 is the year of Excalibur – icon watch Roger Dubuis – watches whose class has already shown some changes in the show preview. The line launched in 2005 has to his credit unique pieces or watches legendary as the brand itself likes to call them. Here’s a quick overview of all the new Roger Dubuis SIHH. The clock Quatuor Excalibur is the first watch in the world to assemble four groups spiral barbell and a case in silicon the four soloists regulatory mechanisms are followed by five differential: even the ticking of this ultra-complicated Excalibur is unique in the world. Two times lighter than titanium, which it is already on its behalf twice more than the steel, it is four times stronger than at the same time. The Knights of the Round Table of King Arthur inspired the Maison to develop a limited series of 88 specimens which represents one out of every index of hours meticulously finished by hand craftsmanship. Twelve knights with their swords forged in gold sit in a circle around a Grand Feu enamel dial. A leading Excalibur twice the complication of the flying tourbillon, adopted by the Maison since the beginning of his career and became his signature. This model is available in pink gold or white gold in a limited edition of 188 pieces in rose gold with black ceramic bezel. The collection Excalibur 42 was developed around two new gauges RD 640 and RD 681 and a skeleton tourbillon with RD505SQ. Brings with it the distinctive and very obvious classic collection: the three loops for attachment the strap, the fluted bezel and slim design to the center of the Roman numerals. It brings together two of the symbols that Roger Dubuis is linked: the flying tourbillon and the skeleton movement, in the version shown with a white gold case. The 165 components have been perforated so as to create a whole a sculpture style futurist. It’s the best timepieces in the collection that highlight the typical Roman numerals Roger Dubuis that dominate printed on the dial. Hours and minutes in the center, date at 6 o’clock and small seconds subdial in a surrounded by a ring in pink gold or stainless steel depending on the material of the bracelet and the case. 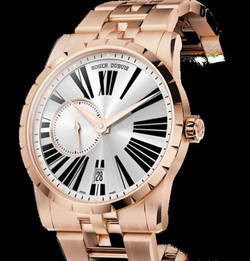 Dedicated to women Excalibur 36 was first presented at the SIHH 2013 with steel bracelets and rose gold. Provides hours, minutes and small seconds at 6 o’clock. And ‘the most elegant Excalibur: all models in the collection are the classic fluted bezel and covered with 48 diamonds. The roundup with all the latest Roger Dubuis presented at the International Fine Watchmaking ends with Hommage Minute Repeater, a timepiece built in just eight specimens is a tribute watchmaker Roger Dubuis, who, in 1995 founded the brand, it established codes that persist to this day.